Our church loves technology that enhances our ability to engage in worship, and so it was with some excitement that we took on a demo of the Panasonic AVHLC100 Stream Studio. The equipment package that arrived also included two Panasonic AW-HN38 PTZ cameras for use as sources into the system. We found that the AVHLC100 system runs on a Windows OS and is fairly easy to navigate, though it does take a little getting used to. Upon initial startup, it automatically launches into the Panasonic software for configuration. This helps you set date and time, establish your inputs and outputs and the software does a decent job at walking you through that process. Our demo unit did have an issue with the HDMI input, so we had to ingest our PowerPoint signal via NDI, which was fairly straightforward with a quick and free download of the NDI Tools onto the PowerPoint machine. Live streaming and recording were straightforward; just input your live stream particulars which are often provided by your streaming host, and you’re ready to go. We used Facebook Live and never had a problem. We brought in our audio from an auxiliary send from our digital audio mixer and we were able to adjust the mix from our smartphone, as needed. One thing we did notice, and something that was a bit tedious, was that in order to use Windows on the HLC100, we had to shut down the Panasonic software, which stopped recording and streaming. We would have liked to see the ability to minimize the software, as with any other Windows software, access what we needed in Windows and then simply pick up where we left off in the Panasonic production software. The HLC100 Stream Studio is a self-contained computer with 4x HD-SDI inputs and 1x HDMI input. Input one is assignable between HDMI or HDSDI. The system comes with 2x HD-SDI outputs, and analog audio input and output via left/right 1/4” connections. 4x USB3, 2x Ethernet, 2x HDMI outputs, 1x 3.5mm mic input and 1x 3.5mm speaker output complete the inputs and outputs. There is also a DB15 connection for tally, for those of you with a tally system in place. 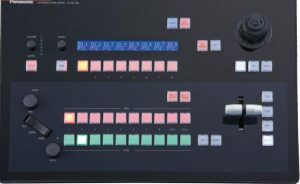 While the HLC100 might appear as a four-channel video switcher, it has an impressive array of features; including 8x NDI (network) video inputs, 2x keyers (title & Picture-in-Picture), PTZ camera controller, builtin RTMP live streaming, graphics creator, on-board recording, audio mixer, internal clip and still store along with a few other tricks up its sleeves. We used the included PTZ cameras and they showed up immediately once connected and we were able to input the video signals, power and control the camera; all via one cable, which should be Cat5 or better. 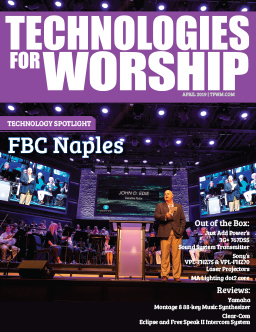 This could greatly reduce the installation and setup time for churches worried about the cost and hassle involved in running power to locations where they wish to put a PTZ camera. In addition, being able to run everything over cable keeps costs low, and you don’t have to run multiple cables to one camera (power & signal) as with many other systems on the market. The overall operation of the system was pretty flawless; we did experience some issues with the recorded files not being recognized by our main computer after the fact, but as this was a demo, that did not affect us too badly. However, seeing as the recording “really simply involves archiving your live stream file as it is created by the encoder” it could mean that we needed to install a particular codec based on our selected options in the streaming encoder configuration. 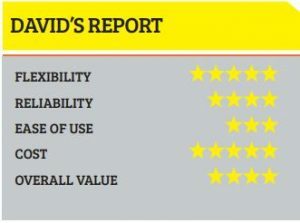 Overall, the system performed well. Once we learned the graphics creation process, creating a lower third template and logo bug was simple and easy to implement on the fly. Last minute program changes were no issue as we could make the changes, as needed, and not be too bothered by the hassle. We feel that the biggest benefit the HLC100 brought was the inclusion of NDI; being able to bring video signals into the unit over the network was huge and such a huge leap forward from running power and signal cables through the walls and ceiling. Also, as mentioned earlier, being able to fall back on NDI to bring in the PowerPoint images when the HDMI input failed to work correctly helped navigate what could have ended our demo before it began. accommodate the HLC100, the keyboard, mouse and monitor you will need. For our small church, we didn’t have a lot of open space in our booth for this and had to shoehorn it into what space we did have. It worked, but if we had been able to have another two feet of space, it would have made things much more comfortable; however, this is not a mark against the system, just a reality we had to face in our particular situation. The HLC100 can be quite loud, especially during boot up with the cooling fans making quite a bit of noise. This is a worthwhile consideration if your video system control is out in the sanctuary or auditorium, where this noise would be distracting. As the system is used throughout the service (and depending on what kind of load you are placing on the unit), those fans can really get going, though we did not experience the same fan noise during operation as we did when we turned the system on, so it may be a non-issue. For the price, the Panasonic AV-HLC100 Stream Studio offers a pretty remarkable value for churches that have a multicamera video ministry, looking to upgrade their system to include the ease of NDI and the power of an on-board graphics creation engine. 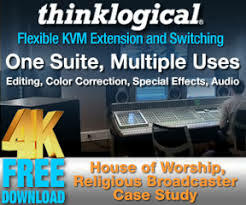 As an all-in-one package that can handle just about anything you throw at it because flexibility has been designed into its very core, this might make a good “mobile” solution for churches that hav1e a flexspace where a myriad of different events often require either a multi-camera live production feeds into an overflow area, or that needs to be live streamed and recorded. 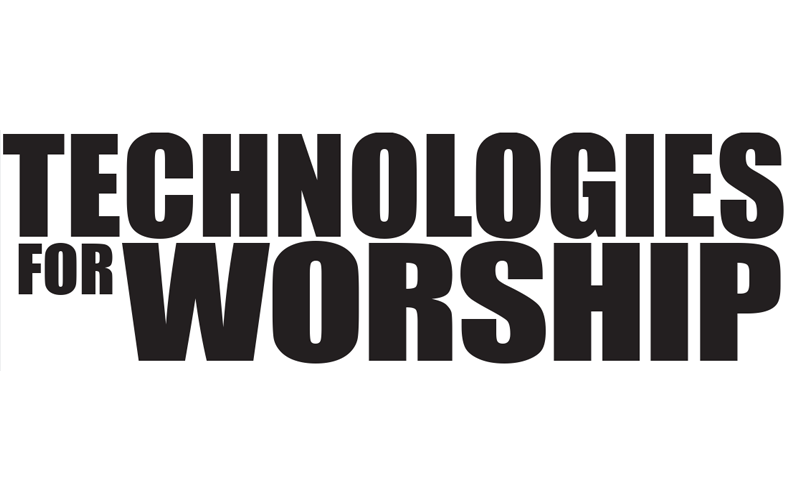 We can’t tell you it’s the right solution for you, but it certainly is a very appealing solution for a lot of churches that are looking for that next step up. David Johnson is Groups Pastor at The Gathering Place, and is an incessant learner, always interested in discovering something new about the world, others, himself, and especially God.